Grasshopper Phone System Review: Best Service, Pricing, Virtual Phone? You are at:Home»Reviews»Review Of Grasshopper VOIP Phone Service: Is It The Best Virtual Phone Service For Small Businesses? Review Of Grasshopper VOIP Phone Service: Is It The Best Virtual Phone Service For Small Businesses? Overall Grasshopper is the lowest cost, easiest to setup, virtual phone system provider for anyone looking for a cheap business line for their business. Whether you have a side business, a startup, or are even a traveling entrepreneur or sales agent, Grasshopper seamlessly integrates with your mobile phone, and their free smartphone app gives you the ability to sound professional and clients will never know you're not in the office. Make outbound calls from your mobile device, and clients will see your business caller id... Same goes for business SMS texting... Customers will never get your personal cell phone number, and you can choose how to direct calls after hours so you're not bothered on your personal cell phone. Grasshopper Phone Pricing Compared To Other Providers – 50% Off? Grasshopper Vs Ring Central Vs Phone.Com Vs Virtual Pbx: Is It The Best Virtual Phone System? In this Grasshopper phone service review, find out if Grasshopper is the right virtual phone system for you! We’ll go over standard features, pricing, setup difficulty compared to other virtual VOIP phone systems on the market, and by the end of this article, you’ll be able to decide which is the best virtual phone system for you. Easy to setup professional business phone system for startup, existing business, or traveling entrepreneurs with unlimited extensions and employees, custom greetings, business sms, personal cell phone integration, and more. Very affordable local numbers, toll free numbers, and even low cost vanity numbers with a free available number search feature to help you come up with a good vanity number for your business. Quick to make a little business sound like a big business with their professional virtual phone system, that connects or forwards to any existing number or device for small businesses and entrepreneurs. Simple to use online control panel, with every setting just a click away. Requires a cell phone or some type of existing hardware. Business owners you want to add a local, toll free, or vanity business line to their cell phone. An entrepreneur who wants a business line with fast setup, no contracts, and no waiting on the phone company… Same day service, up and running in less than a half hour, and making outbound and receiving inbound calls the same day on any device of your choosing. Business owners looking for a virtual phone system that will do everything. 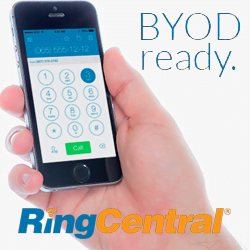 If you want cell phone integration, office desk phones, and a softphone app on your computer or laptop, Ring Central is a better option for you. However, for those who just want a business line for a side business, startup, or traveling business where most communication is done via cell phone, Grasshopper is almost 50% cheaper than the alternative virtual phone system providers. Ring Central – all in one business phone system, complete with hardware leasing if you want to add office desk phones, smartphone app integration, and a softphone app included. *note – pricing and plans options taken from provider website at the time of publishing… May be subject to change or updated at any time. Click here to double check current pricing. Grasshopper is the most affordable virtual phone service provider that gives you access to vanity numbers, local numbers, and toll free 1-800 numbers. With their base plan costing $12/mo, Phone.com is a little cheaper at $9.99 per month, but after you add one or two of their add-on service you might need, Grasshopper is cheaper overall. For customers who just need a simple professional business number, Grasshopper is almost 50% cheaper compared to other comparable VoIP providers that offer a similar virtual phone system. Below we’ll talk about some of the comparison features, in which provider is comparable to Grasshopper for small business. While Grasshopper is cheaper, faster and easier, and most likely the best choice for anyone who wants to connect a business line to their cell phone, as soon as you want to start to add things like office phones or do advanced call tracking techniques like call recording, ring central definitely starts to stand out. I recommend Grasshopper to all business owners that run what I would consider a mobile service business, whereby you’re usually never in the office, and very frequently traveling to your customers or operate a business on the go. An example of businesses that would be a really good fit for grasshopper are: contractors, salespeople, side business owners, and startups that don’t have complex phone system needs just yet, they just need a business line to be professional. I recommend Ring Central to all business owners that also run a mobile service business, but think they might want to expand into having office personnel in the near future. Ring Central makes it very easy to add expensive VoIP office phone hardware, at a very cheap monthly rate so you don’t have to go out and buy all this equipment that would make for a very expensive startup and installation cost. Another really nice feature they offer for free, is something I mentioned all the time… Their business soft phone application, can run on any PC or Mac, and connect to your business phone system from any computer or laptop giving you the ability to take and make calls from anywhere you have an Internet connection. Related Reading: RingCentral VS Grasshopper: Which Is Better? Much like Ring Central, Phone.com is also a full suite business phone system. While their initial base plan pricing is cheaper than Grasshopper at $9.99 a month, most of their features that are attractive are paid add on features, bringing the monthly price up over what Grasshopper costs for people who want a basic business number. The one thing the phone.com works very well for, is advance call tracking and virtual voicemail set up. I’ve used Phone.com successfully to record calls in order to track marketing and advertising, and also to receive voicemails in an email, so I can read them when I’m unable to talk and increase response time to customers. If you’re looking for an easy to set up professional business number, and don’t need any complex functionality, Grasshopper is the best phone service for you. 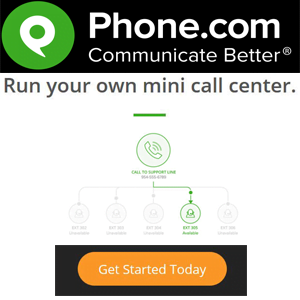 If you’re looking for a complete virtual phone system, that will work in your office, on your mobile, and even your computer or laptop, I would take a look at Phone.com and Ring Central. Any of these VoIP providers, or to save you tons of money over traditional local landline telephone company, and very often the best part is in the cost savings… It’s the ability to have an online control panel, that will allow you to quickly and easily make changes to your phone system, without waiting on the phone company’s customer support to do it for you. A business owner with no experience, can easily manage their own virtual phone system, and forward calls to their mobile device or anywhere of their choosing, they happen to be going on vacation, moving offices, or even routing calls after hours… The ability to constantly stay in contact with your customers how you want and change it on the fly, is always available. Grasshopper is normally touted as “the entrepreneurs phone system.” There well known for being able to let customers quickly and easily connect a toll-free business line to their personal cell phone… And clients will never be able to tell, allowing you to maintain that professional business communication, via their free smart phone app that supports incoming and outbound business caller ID, and SMS business texting. This gives you the ability to select how business calls are handled after hours, and never lets clients see your personal cell phone number caller ID, or even know that you might be out of the office. The Grasshopper app for iPhones is free to download iTunes, and works very well. I’ve used this myself and all my demo videos, and integration was seamless and easy to set up. The android app does have a couple of beta bugs, as users have emailed me a couple of times asking if I’ve had any trouble with it. Unfortunately I only have Apple devices to test on. But I did contact Grasshopper directly, and they let me know that they’re continually improving and developing their smart phone apps, for every new software update from the mobile phone manufacturers. A lot of people want a virtual business number for free, and think Google voice is a good option to use for that. While it might work if you want to use a local area code number, I personally wouldn’t entrust my business to a phone number I don’t actually pay for or own. The biggest thing that stops people from using Google voice as their primary business line, is the fact that they don’t offer toll-free one 800 numbers for business use just yet. As it stands, the voice is really intended as a personal cell phone number, which you could use for business, but they don’t allow you to pick vanity numbers or 800 numbers like Grasshopper. You could however use a cheap forwarding number if you’re on a really tight budget, and forward it to your Google voice number or destination of your choosing what to talk about here. Is It The Best Virtual Phone System? Saying that Grasshopper is the best virtual phone system on the planet is a little subjective to opinion, but I can tell you that is the most affordable option for anyone looking to add a cheap business line to their personal cell phone on the go. Entrepreneurs, side businesses, and start a business owners love Grasshopper for its affordable service, ease of connectivity, and no-nonsense control panel. Whether you want to add an affordable local line, custom vanity number, or even a toll-free 1-800 number for your business, Grasshopper makes it very simple for anyone with no technical experience, and super low cost that anyone can afford. The only situations that I found Grasshopper not to be a suitable choice for virtual phone system for small businesses, is in two situations: one, if you want to be able to do any advanced advertising tracking like call tracking, Grasshopper lacks the ability to do call recording and a few other advanced tracking functionality. To if you want to have an office, or use an office desk phone, Ring Central would be a better choice since they lease office phone hardware for a low monthly fee, and also offer headsets and other phone adapters. Other than that Grasshopper is the best choice for anyone looking to get up and running with the business line, and be able to take and make calls in less than an hour. I’m looking for a solution that offers unlimited minutes as my business is predominantly on the phone. I like what Ring Central has to offer in features but it has capped minutes. Any recommendations?